A row has erupted after a secret strategy to find a single, preferably non-bookmaker sponsor for jump racing's "crown jewel" steeplechases was leaked. Currently the Betfair Chase, Haydock, the William Hill King George V1 Chase, Kempton and Betfred Cheltenham Gold Cup are supported by three different betting organisations. However, a senior official at Cheltenham in charge of sponsorship has disclosed that The Jockey Club, under which umbrella all three big race tracks operate, is keen on change. Perhaps understandably Hills, in particular, are not happy at being, as they see it, plotted against at the same time as pouring plenty of money and effort into their race. Meanwhile, the sponsorship manager has been sent on apparently unscheduled leave. While a delicate situation has not perhaps been as deftly handled as it might have been, plans to formalise a jumping "Triple Crown" are to be applauded. At one stage, £1m was on offer from Betfair for any horse that completed the treble - Kauto Star won it in 2007- but that pot has since been dropped. An all-singing, all-dancing version with the energetic backing of the Jockey Club in particular and racing as a whole could become very big indeed. Remember the excitement and interest created when 2,000 Guineas and Epsom Derby winner Camelot went for Flat racing's Classic Triple Crown in the St Leger in 2012? No horse had completed the colts' treble since Nijinsky 42 years previously - though few had actually tried - and the attempt on history provided just the kind of "narrative" so beloved of marketing bods. OK, Camelot was narrowly defeated, but the build-up and the race itself will be remembered quite a lot longer than many other St Legers. A Betfair/King George/Gold Cup Triple Crown would be even better, as all races are staged over the same sort of distance - a small variation on three miles - but around quite different circuits, and plenty would fancy a go. 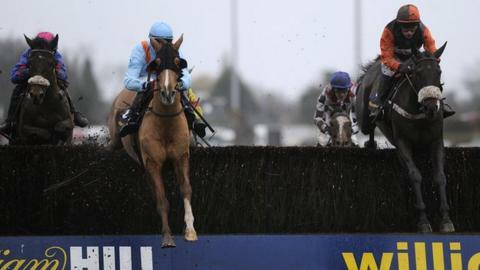 How much longer will it be the Betfred Cheltenham Gold Cup? We have been in a golden era for steeplechasers for some time, and with a decent incentive, it would create even more focus and interest on the jumps season. If a new "Triple Crown" sponsor is found, and Haydock's 2013 Betfair Chase proves to be the last under the current banner, it will be an outstanding way to go out. The line-up for the race, first staged in 2005 but quickly established as a highly significant landmark during the jumps season, is headed by the Cheltenham Gold Cup winner Bobs Worth. The Nicky Henderson-trained eight-year-old relishes his trips to the Cotswold track and the defence of his crown is number one priority, so, if he's vulnerable, it will probably be here. Stable-mate Long Run, a former Gold Cup winner, joins him in the line-up, along with Silviniaco Conti and The Giant Bolster, both of whom have already played their parts in the Cheltenham feature's drama. Dynaste, a young pretender for top honours, is also scheduled to be there along with Cue Card, who, like Long Run, seeks to bounce back after a first-time-out reversal. Add in the rejuvenated Tidal Bay and Roi Du Mee, successful in Northern Ireland's championship chase in early November, and little wonder it's being billed as a "mini Gold Cup" although, actually, there's very little that's mini about it. In an intriguing affair last year's winner, Silviniaco Conti, who was still in with a big shout when falling late on in Bobs Worth's Gold Cup, could be the answer.